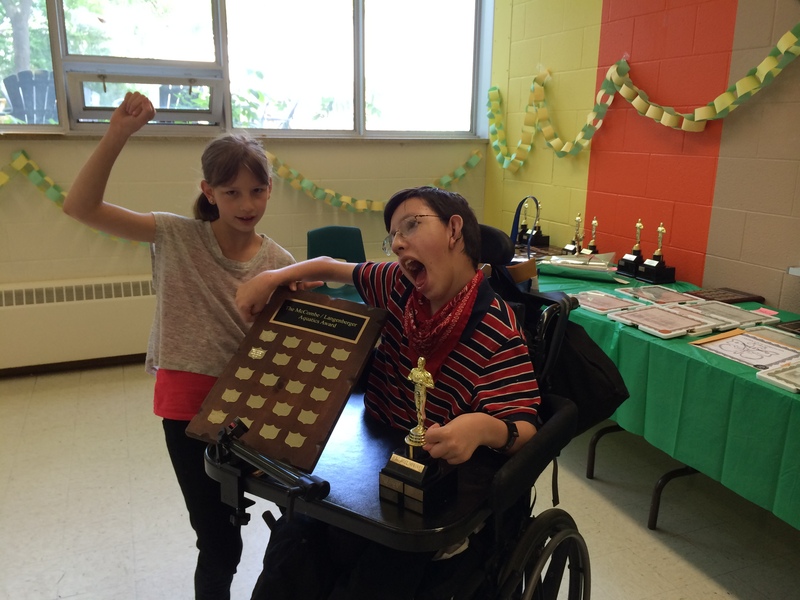 Deane and his sister celebrate his Most Improved Student and Aquatics awards. The unsung heroes: the EAs who make it all happen. OK, so it was a bit long and repetitive. It was the same pattern over and over again. There were many people to thank and pictures to take. But none of us regretted the morning we spent in the school basement. When you’re the parent of a disabled child there aren’t many occasions to celebrate your child’s accomplishments – especially not in public. Their successes are things we notice, but they don’t rank on the scale the rest of the world uses. They are not going to win academic scholarships or athletic awards. Deane goes to a regular high school that houses a special education pod. The classes include students with developmental and physical disabilities. All of them are working on their own individual education plans within the Independent Daily Living course. What these students accomplish may not mean much to others: being able to ride public transit to school by themselves, learning how to collect recycling from other classes or simply bringing a smile and positive attitude to school every day. But every parent, sibling and grandparent in the room knew that these were huge accomplishments. The winners’ names (yes, everyone won something) go on trophies and they get a certificate to take home, but the best part of it was having your child acknowledged publically. It was a proud moment that doesn’t happen very often for our kids. And for those of us who are on the end of daily “What I did at school” sheets, it was a revelation of how many people participate in helping our children reach those goals. There were the students from other classes who drop in to volunteer and the student council president who moved the council meetings to the ground floor so students in wheelchairs could attend. We also met the music teacher who opened his computer music class to kids with developmental delays and the cafeteria chef who has adapted his kitchen so that all students can participate in cooking. There were also the college and adult-education co-op students who spend time in the class learning the nitty-gritty of working in this kind of special ed. And, at the very end of the morning, there were the educational assistants. All morning, they were sitting with our kids, coaxing them not to be shy, pushing their wheelchairs, explaining what was going on and tending to their needs. As the ceremony rolled on, they were busy doing the amazing jobs they do every day. 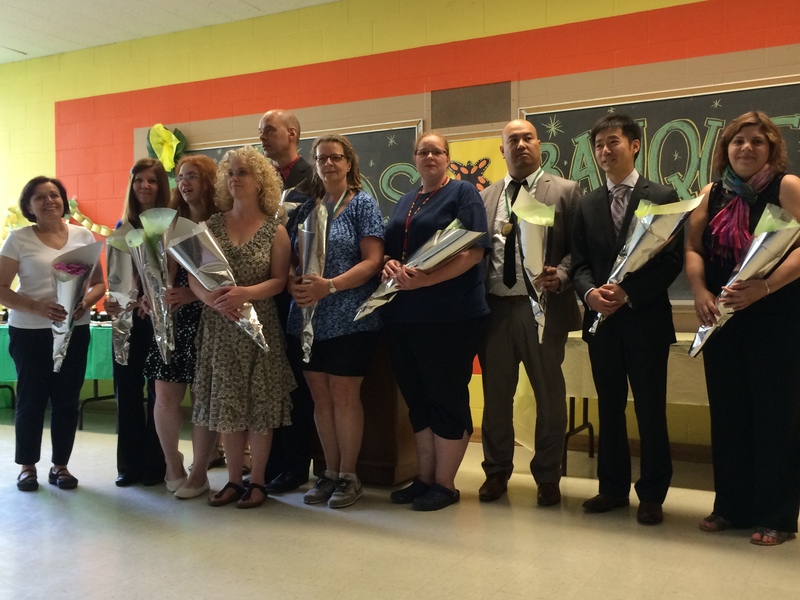 A round of applause and a bouquet of flowers doesn’t come close to appropriately thanking these incredible people for what they do for our kids – and through them – for us. We were recognizing the students’ accomplishments, but it is clear none of those goals would have been possible without the unsung heroes who are educational assistants. As the school year comes to an end, a huge thank you to all who have made school a positive experience. « Happy 16th Birthday Deane! What a lovely post. Your child is very fortunate to have a parent like yourself. Being disabled myself, I cannot imagine how much it must hurt your heart when your child has to go through difficult and perhaps painful ordeals. But it is a comfort to know that you have his back, and that you are thoughtful enough to realize and appreciate the measures his school has taken to accommodate its disabled students. Hmm… maybe they can have parent awards to recognize the wonderful moms and dads that make their children’s situations a little more bearable?! Thanks for your wonderful comment. In our experience, the teachers and staff are often very supportive of the efforts parents make to help them understand and help our children. I always try to approach a new situation as an opportunity work as a team to create the best situation for Deane. So far I have been rarely disappointed.